Over the years, people have battled and captured hundreds of Pokémon. And while everyone has their favorite, no pocket monster is as infamous as “Missingno.” That’s because Missingno isn’t quite a Pokémon at all. Let me explain. As Pokémon veterans and gaming history buffs know, Missingno is a glitch that players can find in Pokémon Red and Blue. With the re-releases of these games around the corner, I thought I’d take this opportunity to break down the many reasons why Missingno stands as one one of the coolest, most notorious glitches in gaming. If none of these look like normal Pokémon, that’s because they aren’t. They’re known as “glitch Pokémon,” and they happen because of something funky in the programming of Pokémon Red and Blue (we’ll get to that in a second). This aberration is why Missingno can sometimes look like a fucked up barcode, and why it has a type that doesn’t actually exist in the game (“bird” is a Pokémon type that eventually got cut in Red and Blue, presumably replaced by “flying” type Pokémon. If you’re curious, bird-type Pokémon function exactly the same as normal type Pokémon, in terms of strengths and weaknesses). In addition to that, while all of those sprites might have different characteristics from one another, the most famous type of Missingno—the backwards L-shaped one—can sometimes appear well over the normal level 100 limit placed by the game, and it knows the move “water gun” not once, but twice. The ghost and fossil versions of Missingno, meanwhile, have movesets that are determined based on Pokémon that a player has in their party. The version of Missingno that players encounter in the game depends on the player’s in-game name. Finally, none of these Pokémon can evolve, though funnily enough, Missingno has the highest base attack stat in Red and Blue, as well as the lowest base defense stat. EDIT: Some people are messaging me about their Missingno evolving into a Kangaskhan—while that glitch Pokémon looks like Missingno, it’s actually an entirely different Pokémon called “’M.” Missingno, after all, is not the only glitch ‘mon in the games! But I can definitely see why it would be easy to confuse both glitches, given that visually they look very similar. How do you find Missingno? While doing this, you might encounter random Pokémon with all sorts of wild levels—but occasionally, you might encounter Missingno. This is where things get complicated. Missingno’s appearance in player’s games is a combination of a few different things. The way the original games are programmed, they use variables to refer to specific Pokémon. Variables are stored as powers of two—so, 1, 2, 4, 8, 16, 32, 64, 128, 256 and so on. There are 151 Pokémon, which means you need 151 variables. 151, however, is not a power of 2. The first usable variable that can fit all 151 Pokémon, then, is 256—a number large enough that it leaves 105 variables empty. This is where Missingno comes in—Missingno is short for “Missing Number,” and is the stray Pokémon that the game potentially spits out when it doesn’t know what Pokémon it’s supposed to let the player encounter. For whatever reason, the little strip of land on Cinnabar Island is programmed such that things can spawn there, but not programmed to know what specific Pokemon should spawn there. So we know that Missingno is stored in the game, and we know that there’s a patch of land that can potentially let you encounter Missingno. But why? This is where the old man glitch comes in. When you let the man show you how to capture a Pokémon, the game temporarily changes a player’s name to “Old Man.” It still stores your old name, too—but for some reason, during your encounter with the old man, it’ll throw that information to where the variables for Pokémon are kept. The game will grab that info and revert back to normal once a player gets into another encounter...unless of course the next encounter happens to be on the patch of land on Cinnabar Island, where the game has no specific encounters programmed. Remember when I said that Missingno is influenced in part by the player’s name? 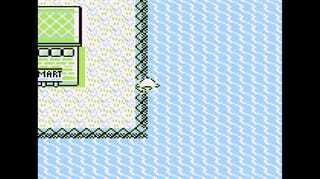 If a player goes to Cinnabar Island after speaking to the old man, the information kept in storage for what Pokémon to encounter will be the player’s name, which can then lead to the game thinking it has to load a Pokémon that doesn’t actually exist. Boom, Missingno (might) appear. This, however, is the oversimplified version of why Missingno appears in Pokémon Red and Blue. If you’d like the more complicated version, which dives deep into how things are programmed on the Game Boy, I highly recommend reading this write-up by Smogon. Why would anyone seek out this glitch? More pragmatically, there are uses for the glitch, too. A side effect of encountering Missingno is that the sixth item in a player’s bag will be multiplied. Want more than a hundred Master Balls, or more than a hundred Rare Candies? Try the Missingno glitch. Another useful aspect of the Old Man Glitchis that players can totally make the game spawn a Pokémon of their choice at a high level, provided they have the right in-game name. Endless powerful items, combined with the ability to spawn powerful Pokémon, makes the glitch worth doing even if you don’t care about Missingno at all. Yes, even if it messes up the way the game saves your Hall of Fame data. Why is the Missingno glitch so famous? First, Missingno isn’t just a glitch you view, or a glitch that happens to you. You can go out there and seek it out on your own, myth-hunter style, and capture it. It’s the equivalent of putting Bigfoot in a cage. And while the rest of the Pokémon in Red and Blue are ‘normal’—they often reference creatures we know in real life, like pigeons and dogs—Missingno is a Pokemon that defies everything you know about Pokémon. No Pokémon is like it; the only one that comes close is Porygon, a Pokémon made out of programming code. But Porygon just kind of looks like a bunch of geometric shapes together, and it evolves into something that resembles a duck. 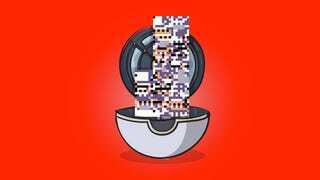 Players wish it was as strange as Missingno. Missingno is also the rare instance where a myth that ‘everyone’ hears about happens to be true, which instantly makes it cooler than legends like “you can revive Aeris” or “you can find Mew under a truck.” Plus, every player’s encounter with Missingno is somewhat unique, given that so many of its aspects are dependant upon the player’s name. There might only be a few different versions of Missingno, sprite-wise, but the Missingno I capture will likely be way different than the Missingno you capture. Missingno has also spawned all sorts of creepypasta and theories regarding its significance in the Pokémon world. Some people say that Missingno occupies the slots of deleted Pokemon that didn’t end up making the cut. One of my favorite fan theories posits that Missingno can be considered an intentional inclusion. Consider Cinnabar Island, and its Pokémon Lab. The player uses the Pokémon Lab to resurrect fossil Pokémon, but it’s also where scientists created Mewtwo, one of Pokémon’s most famous legendaries. That is to say: Cinnabar Island is a place where messed-up experiments have taken place, all in the name of engineering new Pokémon. How perfect is it that a player would encounter a monstrous, inexplicable thing on Cinnabar Island? Or the fact that this Pokémon is number #000, or that it’s capable of learning any move? How perfect is the fact that all of its forms are liminal things, like glitches, ghosts and fossils? How perfect is it that, should a player use Missingno in battle, other sprites may become scrambled or reversed? How perfect is it that when Missingno cries out, it sounds like garbled versions of other Pokémon we know and love? Lavender Town might be the most famous Pokemon creepy story, but Missingno is, in my mind, the scarier tale. Missingno isn’t supposed to happen, but it does—and if you think about it, the fact it exists makes an unsettling amount of sense. Players have also found ways to trade Missingno into other games. They’ve imported Missingno into games like Pokémon Stadium (where it’ll appear as an item known as doll, or a Ditto in the case of Stadium 2). And players have even inexplicably found something that resembles Missingno in Pokemon X & Y. What Does Nintendo Say About Missingno? MissingNO is a programming quirk, and not a real part of the game. When you get this, your game can perform strangely, and the graphics will often become scrambled. The MissingNO Pokémon is most often found after you perform the Fight Safari Zone Pokémon trick. To fix the scrambled graphics, try releasing the MissingNo Pokémon. If the problem persists, the only solution is to re-start your game. This means erasing your current game and starting a brand new one. Way to be party poopers, Nintendo. But while Missingno isn’t officially supposed to be a part of the game, and while it can actively corrupt certain pieces of the game, I sincerely doubt anyone is going to stop tracking Missingno down in Red and Blue. Some glitches are just too tempting. Holy Crap. Has The Famous Glitch, Missingno, Returned In Pokémon X & Y?